For over eight hundred years Riga, the capital of Latvia, has been a major city in the Baltic region. Riga is the political, economic, and ecclesiastic centre of the whole region and, moreover, situated at the mouth of the Daugava, halfway between “the Vikings and the Greeks”. It is also a bridge joining the East and the West. Due to its advantageous geographical situation, Riga has long been coveted by more powerful neighbours, therefore in its long history, Riga has experienced countless wars, invasions and sieges. However, over the centuries many generations of Riga's inhabitants have managed not only to preserve but also to multiply rich cultural heritage of their city, and its unique, glamorous beauty for what Riga is used to be called as the adornment on the bosom of the Daugava. As in the past the capital city of Latvia today is attracting tourists from all over the world. Riga is located along the Baltic Sea at the southern coast of the Gulf of Riga where the sea meets the 1000km long river Daugava. The city is situated in the middle of the coastal plain standing 1 to 11 m metres above the sea level and the only separate areas of sand hills in its surroundings are 10 to 28 metres above sea level. The beginnings of Riga refer to a small peninsula that later vanished and that had been surrounded on three sides by the river waters of the Daugava and the Riga (Rīdziņa). The peninsula was first inhabited in the 10th-11th centuries according to artefacts discovered by archaeologists. In the next century settlements appeared somewhere between the existing Mārstaļu and Grēcinieku iela and at the old port, the so called Lake Riga (at present the region of Albert’s Square). Ethnic structure of the inhabitants in the settlements was mixed: along with the Livonians there were also Zemgalians, Latgalians, and Selonians. The old inhabitants of Riga were engaged in fishing, agriculture, craft, and trade. As early as the second half of the 12th century, Riga was a popular market place where not only local inhabitants but also merchants from Gotland, Russia and other countries traded their goods. In the 1170s, German merchants started their first visits to Riga. Around 1184 Monk Meinhard arrived at entrance to the Daugava, and in 1198 Bishop Berthold started the forced conversion of the Livonians with the support of Saxon troops. Imaut, a Livonian, in a battle near Riga, killed him. In 1198 the word “Riga”, namely the village of Riga (locus Riga), was mentioned for the first time in the written sources – in the Chronicle by Latvian Indriķis. July 12 – 13, 1210 – the Cours attack Riga but fail to occupy the newly-built Riga. July 25, 1211 – the foundation stone of the present Riga Dome is laid, i.e. the construction of the suburbs (suburbium) or new part of the city (in nova civitate) begins. February – March, 1215 – Riga city is destroyed by fire; the first Dome Cathedral and its buildings burn down. 1221 – 1226 Riga’s landowners fight for the right to take part in city government. The city council starts working and equality of the city, bishop and the Order for Knights of the Sword is declared. Riga acquires the rights of Gotland (Visbiya). 1237 The Order of the Knights of the Sword is incorporated in the German (Teutonic) Order. The first half of the 13th century Construction of the suburbs continues (the Holy Ghost Convent, St. John Church, the Riga Dome Cathedral and dwelling of the priests’ dome chapter, the Bishop’s second castle and other buildings) and it is being fortified with a new stretch of defensive wall along the Daugava to the Holy Ghost Convent and along Lake Riga to the current Pulvera tower, as well as straight along Torņa iela. September 8, 1282 After concluding a treaty with Luebeck and Visbiya the city of Riga joins the community of Northern German trade cities, the Hanseatic League. 1293 The first building regulations of Riga are approved. 1297 – 1330 Armed conflict between the Livonian Order and the city results in the Order’s victory. Riga becomes a city of the Order. The Order commands the inhabitants of Riga to build a new castle in the place of the ruined castle. 1330s The territory of the new market place turns into the administrative and public centre of the city – Rātslaukums. A new city hall is built, supposedly the so-called New Hall, later the House of Blackheads. 1481 – 1491 Final armed conflcits between the city of Riga and the Livonian Order. 1522 The Reformation begins in Riga. 1524 "Icon Pogroms" take place in the city churches. 1537 - Building of new fortification system (earthen ramparts up to 11 metres and water ditches formed) and building in the zone of inter-ramparts started. 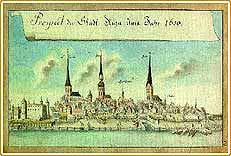 1561 - 1581 After the collapse of the Livonian confederation, Riga acquires a status as a free city. April 7, 1581 Riga surrenders to the King of Poland. 1621 – 1710 The city is under Swedish rule. Improvement of the fortification system takes place: six bastions and four ravelins are built; rampart outer walls are laid with stones and dungeons and priming storehouses are built in them; water ditches are deepened and broadened. July 14, 1710 Russian military forces occupy Riga. It is incorporated as a component of Russia and becomes the capital city of Vidzeme and the residence of the governor general. End of the 18th century – beginning of the 19th century Intensive building and reconstruction works begin in the surroundings of the Riga castle. 1812 The suburbs of Riga are burned down during the Napoleon’s invasion. The second half of the 19th century and beginning of the 20th century The city fortification system is broken down and new regions of the suburbs are developed. November 18, 1918 Sovereign Republic of Latvia is proclaimed and Riga becomes its capital city. 1918 – 1940 The Court castle and Ministry of Finance, several schools, Economic shop of the Army, Market pavilions and many other buildings are built. The Freedom Monument, the ensemble of the Warriors’ Cemetery and Open Air Museum begin construction. June 17, 1940 Riga is occupied by the USSR Army. August 21, 1991 Independent Republic of Latvia is renewed.